Pepper here, and I'm tickled all the way down to my funny bone to welcome famous author, speaker, and teacher, James Scott Bell. 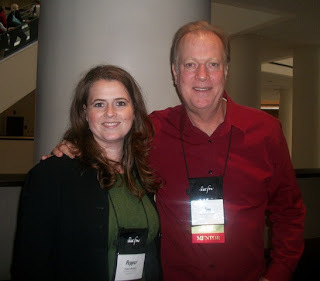 (To the left is a picture of me and Jim yesterday at ACFW in Indianapolis). I met him three years ago at my very first Blue Ridge Mountains Christian Writers Conference and took his ficiton writing course. WOW! I realized then, for sure, that I was a writer. Sitting through that class confirmed all my weirdness in three short days. Oh, what a feeling!!! Two years ago, he was back at BRMCWC - and it was a pleasure to see him again. This weekend, he's up in Indy with loads of other authors, and aspiring authors, at the American Christian Fiction Writers annual conference. So, I'm so happy to have him as our guest today on The Writers Alley. You are an author of both fiction and nonfiction, an adjunct professor, and a fabulous presenter. What parts do you enjoy most about those various hats you wear? As a novelist, my greatest pleasure is in making up stories. I love the creation aspect, the idea phase, coming up with plot and character and then seeing how I get there on the page. This is my foundation. I consider myself a novelist first, and everything else follows. When I'm in a classroom situation, I love seeing lights go on in the students' eyes. When they "get it." In fact, I've lost count of the number of people who've come through workshops of mine and have gone on to be published or have improved their craft and have been kind enough to credit me with part of that. That is enormously satisfying. I really appreciate how approachable you are. Every time I’ve had an opportunity to meet you, you’ve been tremendously encouraging. Who are/were some of the people in your life who took time to encourage you in this crazy writing journey? The first influence was my mom, who encouraged my reading and who was herself an aspiring writer. She helped me to be creative and write stories when I was in elementary school. I got into sports pretty heavily, but in high school I had a wonderful English teacher, Mrs. Marjorie Bruce, who saw something in me and helped to bring it out. I stayed in touch with her over the years, and in fact we were very close until her death at the age of 90. She was probably my biggest influence. And then there are all the writers who spoke to me through their fiction. The ones who spring to mind immediately are Hemingway, Steinbeck, Saroyan, Raymond Chandler, John D. MacDonald and the ghost writers of The Hardy Boys series. Your nonfiction book, Plot & Structure, was one of the first writing craft books I ever read. Do you still use the three-point plot structure for your novels, and how might you modify it a bit? I use everything in Plot & Structure. That's why I wrote it. I put in there all of the things I had to learn by trial and error, so they are hard won techniques that actually work. I don't modify structure, just as I wouldn't try to modify the Golden Gate Bridge. The originality in stories comes from character and concept, spiced up with great dialogue and surprising scenes, but poured into a solid structure that I have found works the best for telling stories. Are you a pantster? Plotter? Plantster? Whatever you want to call it – how do you write your books in a nutshell? I learned how to write screenplays first. I used the index card technique to lay out a structured story, and I still do that for every novel. How heavily I outline has varied, sometimes depending on how much of the story is in my head. I do outline Act 1 fairly extensively, because that is where all of the story elements need to be strong or the book will sag in the middle. I like to have a pretty clear idea of how the book will end, though that is subject to change as the book goes along. You have to have some breathing room so the book can be organic. I remember once having a wife character who I planned on having leave the family home to be safe. But when I got to that scene she refused to go. I argued with her. She stood her ground. It was the right decision. It changed the direction I had planned on, but I wasn't so wedded to an outline that I couldn't go there. I don't take too hard a stand on this issue. But people who are purely seat-of-the-pants writers will benefit from a little more forward thinking. And those who like ironclad outlines, though they work for many writers, need to be open to the needs of the story as it develops. I really appreciate the fact that your books are set in your hometown. Los Angeles. I know that stories happen everywhere, but what do you find most helpful and intriguing about placing your novels in a very familiar city. Any challenges to that? Los Angeles is the greatest noir city ever. Because of its diversity there are an infinite number of settings, plot points, crazy characters and so on. It's just so rich, and I love going to places in the city I'm not that familiar with and getting to know it, taking pictures, walking around. If I was smart, though, I would set my books in Hawaii. What makes writing a thriller so…well…thrilling? You must like it, since your books span both Inspirational Fiction and Mainstream fiction. What are some reasons you enjoy writing thrillers over, shall we say, romance? I think thrillers where the original stories. Of the Caveman sitting around a fire making himself look good by telling the rest of the tribe how a mastodon came after him and he bravely fought it off. Thrillers bring a sense of order to a chaotic world. A sense of justice in the heart of darkness. People need to believe that. That's why romances are popular, because people want to believe in love. In thrillers, people want to believe that good can triumph over evil. Plus it's just plain fun to keep people up at night, turning pages, as you take them on a roller coaster ride. What writing advice would you give to those of us who are either learning the craft or spreading our proverbial wings out toward publication? Work under a quota system. That was some of the earliest and still maybe the best advice I got. I do a weekly quota, because there may be days that I miss for some reason. But I do my 6000 words a week, taking one day off to rest. You have to finish what you write. You have to get to the end of that novel you're writing. You learn the most by just working through, pushing through, and then stepping back and trying to learn what works and what doesn't. That's why I write my writing books, to help writers work through those issues. But the most important thing is to write and finish what you write, and keep on doing it. I think for just one day I would like to be Sister Mary Veritas, the basketball playing nun from my series, Try Dying, Try Darkness and Try Fear. I have never been a basketball playing nun and probably never will be, so it would be an experience. But then I would want to return to my real life where I don't have to wear a nun's habit, where I can still wear a Hawaiian shirt, shorts and flip-flops to Starbucks and do some writing. For someone who is not at the ACFW Conference this weekend, this interview was just what I needed! Wow! What a great interview, Pepper! And Scott, I have two of your books and have been re-reading them, trying to absorb all the rich information they contain. Thank you so much for sharing your gift to the world! What a THRILL to read this! And love the photo of you two! Thanks James for doing this interview, what an inspiration and motivation! Frank, you have a tremendous gift.